Virgin Galactic's second SpaceShipTwo lowers its landing gear for the first time while under construction in Mojave, California. 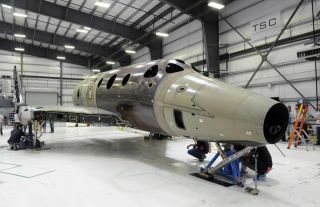 Virgin Galactic's second SpaceShipTwo passenger ship is coming together, with the commercial spaceliner lowering its landing gear for the first time last week. SpaceShipTwo lowered its landing gear on May 21 in the ship's construction hangar at the Mojave Air and Space Port in California. Virgin Galactic plans to use a fleet of suborbital SpaceShipTwo spacecraft to fly paying passengers on roundtrip space missions. "Still much to be done, but it's looking great," Virgin Galactic representatives wrote in a Twitter post. Virgin Galactic's construction arm, The Spaceship Company, is building the craft for the space tourism company. The announcement comes more than five months after the tragic crash of Virgin Galactic's first SpaceShipTwo vehicle during a test flight over the Mojave Desert on Oct. 31. During that test, one SpaceShipTwo test pilot was killed and another seriously injured when the spacecraft's braking mechanism was deployed too early, while the spacecraft's rocket engine was still firing. Virgin Galactic's SpaceShipTwo is designed to launch eight people (six passengers and two pilots) into suborbital space and then return to Earth to make a runway landing. The spacecraft will be carried into launch position by the high-altitude WhiteKnightTwo, which serves as the mothership for the suborbital space plane. Hundreds of would-be space travelers have reserved tickets for a SpaceShipTwo flight, including celebrities like actor Ashton Kutcher and singers Lady Gaga and Justin Beiber. Tickets for a SpaceShipTwo seat are available for $250,000.